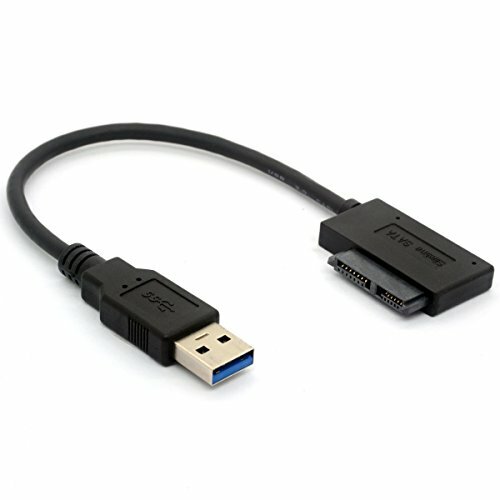 This USB 3.0 to 13Pin Female Adapter is the latest third generation product, smaller, lighter and firmer. It's so practical, powerful and convenient for working normally. USB 3.0 to 7+6 13pin Slimline Sata Cable to be used for small Cd DVD Rom Optical drives(internal, laptop), Blu ray optical drive ect.to be taken externally. Interface:USB3.0 to 7+6 13pin Slimline Sata plug, connect internal SATA optical drive externally, convert your slim DVD drive to portable USB drive instantly. Plug and play , Easy to install. Note: The slimline sata cable only fits SLIMLINE SATA 13 PINs drive from laptops, NOT fit the optical drive from desktop PC. The drive is not included. If you have any questions about this product by BSHTU, contact us by completing and submitting the form below. If you are looking for a specif part number, please include it with your message.